There she is in all her glory with cute little babies in both arms. Although she now has 4 girls, 2 boys, and were not sure what is next on the way with Mandi so she has 7 grandkids in about 5 years, not too bad Grandma. Happy Birthday to the best mother in-law I could ask for. I'm truly blessed to be a part of the Lashmett family. Shirley has demonstrated to me time and time again of her selflessness. She is always thinking of others and often sends goodies just because, to the kids and myself even :) She never forgets birthdays, anneversaries, and special occasions. She is a workaholic, and sets the standards high for those who are to follow her. She taught my husband how to work hard, and how to treat women and I'm greatful for that. 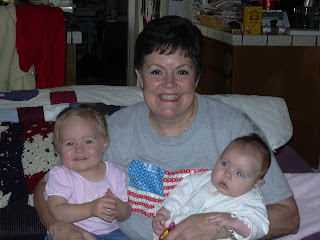 She is a great mother to her children, and an even better grandma to her grandkids. Wish we could be there to celebrate this day with you. Great post. Happy Birthday Grandma! Happy Birthday Aunt Shirley! You are such a special mom, Grandma and aunt. We love you! This is me, in tears again. Thanks for such a nice Birthday wish. You are very special to me too, to take such good care of Scott and the kids. PS Thanks for the Birthday Song.